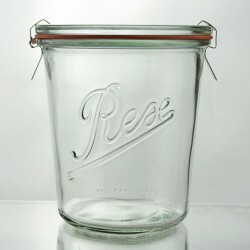 These Rex Jars are perfect for using in the pantry. I store powdered sugar, cocoa, nuts, etc. in mine. I label them with a water-based paint Sharpie, in medium, using either black or white, depending on the color of the contents. These are stackable, too. i love these jars. they are perfect for “refrigerator oats” and they seal so wonderfully for on-the-go breakfasts. i also use them for seasoning blends, ghee, &amp; other kitchen essentials. the wide mouth makes them perfect for access w larger spoons, hands/ fingers for pinching, and the seal keeps contents fresh. they are also aesthetically beautiful. Beautiful and as described. However 2/6 arrived broken. Amazon only seems to allow a full return for refund... I just want my jars. These are nice jars. I'm not sure I like how they clip closed - too easy to lose the clip, I think. Exactly what I was hoping for. I love the shape and the size makes for a generous desert, cute parfait or decent canning amount.These were all in perfect condition when they arrived. I’m honestly slightly surprised because the packaging wasn’t great, but it came in a package with other things I ordered, so maybe that helped. I use them regularly. Wider mouth model might be easier to fill. But these are cuter. The Rex tulip jar is absolutely perfect. I have been using them for Sous Vide bread and butter pickles, pickled Brussel sprouts and a pickled vegetable medley. Please note, the rubber gasket should be soaked in hot water in order to achieve a proper seal. In sum, the jars are very functional. Pretty and functional. My first order did not arrive and I had to reorder this product but oh, when it finally came and I was able to use these jars, they were perfect for my home-made single serving breakfast yogurt. I also store my nut butters in them. They're pretty, easy to use, and just the right size. The Rex mini tulip jar with soft curves and enticing shape makes every dessert really yummy! Sufficiently large to accommodate most sweet delights, the jar is a charming way to showcase all sorts of creams, puddings or yoghurts. Perfect also for gifts, candles and picnics. Absolutely free of plasticizers and heavy metals. Heat resistant and reusable. Suitable for all dishwashers, freezers, ovens or microwaves. 6 x 1/2 litre Weck Deco Shape - 901 - includes glass lids, seals and clamps1/2 litre (exact capa..